Giraffe, Elephant, Hippo and Baboon live by the lake. All have very busy lives and apart from a polite nod of the head, wave of the trunk, swish of the tail or gruff grunt; they rarely spoke to each other. Until one day Giraffe sees the shadow of Lion creeping closer and closer. Can the animals band together to scare Lion away? This book is a delight to read out loud. 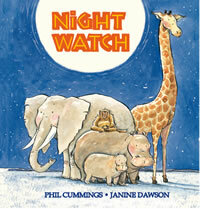 The text is full of movement and colour, with language children will love to repeat. Always love a good Boom Boom Boompety Boom and Splish Splash Burp! Dawson’s vibrant watercolour illustrations bring the landscape and the animals to life. I especially love the hippos swimming in the lake. There is so much joy in their expressions. Priceless. This book is suitable for pre-school and lower primary age children. It would offer the chance to discuss sound and movement, shadows and music, as well as being a great book to read at bedtime.